With this being a local game, it was decided by a few to ditch the cars etc and have a Christmas drink, so myself, Jenson and PK descended on the Oddfellows pub pre match. We were later joined by Lee, Jess, Clive, James, Luke, Mick and Nick as the team news filtered through. Unfortunately Sam couldn't make it today. We were all highly hoping Charlie Austin would be fit again as our lack of strikers was certainly exposed on Boxing Day. But it wasn't the case and the further surprise was that we were lining up with no recognised strikers at all. I was predicting it would be Yossi Benayoun that would lead the front line, but got that totally wrong and it was in fact Niko Kranjcar up front. Unfortunately, it was much a case of very much the same in the second half and I think if either side would have really 'gone for it' such to speak, they would have won it. Watford had their best chance midway through when Green saved well from Fabbrini following a neat one-two with Deeney. Matty Phillips stung the hands of Almunia but despite plenty of possession and Andy Johnson on the field for the final 20 minutes, Rangers failed to find any sort of cutting edge. A straight 2 way split, with Lee and Jess picking out Niko Kranjcar, but with votes from myself, Jenson, PK, Clive, James and Luke via Twitter, today's award goes to Joey Barton who was very much missed against Forest. Just myself , Lee and Jenson sampling the Chicken Balti's - very flaky pastry of which if you looked at the floor, you would certainly know where I had been standing and the feeling was that the their was plenty of filling but overall, quite dry - a 7 each from myself and Jenson and a 5 from Lee, which in fairness, was probably the more accurate as after a good few pints, anything would have tasted good..
After we said our goodbyes, myself, PK and Jenson went into the High Street to continue the festivities.. We landed in the Moon Under Water Pub for what was supposed to be a few beers then on for a curry... We were joined by Watford fans Toby, Adam, Steph and Kieron before Jo , Danny and several more as the evening went on and some great and must say, good natured banter went on throughout the evening.. But we should have known better really, as drinking with Jenson will mean that some point in the evening, Jagermeister will be involved..
Lee will return on Wednesday for the visit of Doncaster to Loftus Road but until then, on behalf of myself and everyone involved in and around of Lofty Heights, may I wish you all a VERY HAPPY NEW YEAR!!! The Boxing Day schedule was not kind to R's fans as those lovely people at Sky changed our kick off time to 7.30pm, meaning many of us had the choice to only spend lunchtime with the family or sit at home and watch proceedings from a comfy armchair whilst those mental enough hit the motorway to Nottingham. Amongst those of us that were crazy enough to travel were Jess, PK and myself. The rest of the gang were sensible enough to stay at home and I cannot blame them one little bit!! After a very smooth drive with my Sat Nav taking us the unconventional route via the countryside between Leicester and Nottingham but we arrived in good time for the three of us to walk around the City Ground looking for the ticket office to collect our tickets before getting into the ground to sample the pies (which I will come to later) and then take our seats in the lower corner of the Bridgford Stand. On our walk around the ground the Team News was released and we were given quite possibly the worst gift an R's fan would want to receive......... Bobby Zamora in the starting eleven!! Zamora replaced Charlie Austin owing to a slight hamstring injury (what is it with us and hamstring injuries this year??). 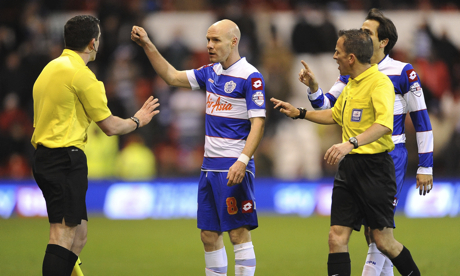 The other forced change was Karl Henry replacing the suspended Joey Barton. Well it's fair to say we were terrible in the opening 45 minutes!! If Forest employed a conventional striker rather than a left back for this game they would've been 3-0 up at half time and we'd of been half way home by the full time whistle! As it was we were only one down at the interval due to Halford's powerful header from Abdoun's cross following some atrocious defending from Rangers'. Some people will say it's unfair of me to pick out anyone for not playing yesterday, however I have to say that Kalvin Henry and Zamora were the biggest let downs in the first half. They showed no signs of wanting to fight for the cause as Henry was regularly left flat on his @rse following his mistakes and had the audacity to moan at the players around him afterwards. As for Zamora what can I say, useless!!! His attempted cross in the first half was terrible and we all thought his right foot was his weaker foot, it turns out his left is just as bad!! As expected the start of the second half saw the R's make two changes as Andy Johnson and Junior Hoilett replaced the two useless people mentioned above. These changes bought a renewed energy to the R's and it looked like we finally wanted to partake in this football match! Hoilett was soon becoming our attacking outlet that we were lacking down the left hand side whilst Phillips and Krancjar continued their good first half performances. Rangers' for all their huff and puff just did not create any clear cut chances to trouble the Forest 'keeper Darlow. On 80 minutes came the controversy for Rangers'. Abdoun cleared following an R's corner to Halford, who seemingly flicked the ball on to Reid and prompted the linesman to raise his flag for offside and all the R's players stopped as Reid continued and slotted the ball home and went off celebrating before the referee shocked us all and gave the goal and incensed the R's players and fans alike as we all saw the flag go up and just instinctively stopped. At the time we were all absolutely furious and in a way I still cannot accept the decision as we all know that if any of the top clubs in the country had the flag raised in that situation then the offside would of stood and no goal would've been given. Having said that.... the right decision was made and Forest rightly won 2-0. Overall Forest were deserving of the three points and really could've won by more had they had a decent striker on the field. Rangers' were terrible and very few people can come away from that game saying they had a good game. We were far too slow with our passing and really did not show any type of adventure during the first half and despite improving significantly in the second half, we just did not do enough to warrant any type of result last night. We really need an injection of pace within the team, a bit of the unknown because we are very predictable and teams have sussed out our style of play, we need a plan b! 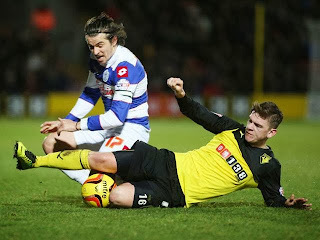 I'm looking forward to welcoming back Barton and Austin at Watford because they were hugely missed yesterday. Despite the disappointing display we were able to pick out three decent performances, with one getting all the votes from the three of us in attendance and with that being said Niko Krancjar gets our Man of the Match for the R's. On to the all important Pie Rating! Both PK and myself opted for the Chicken Balti Pie. PK awarded a 5 and I have awarded a 4. The reasons behind our ratings are due to the pies lacking in any type of filling and what was there was extremely dry. My pie lacked any type of puff top on it and looked like someone had walked on it before it was given to me. This gives Nottingham Forest an offical pie rating of 4.5. Lofty will return on Sunday following the Watford game with hopefully some better news in terms of results and pies!! As this is my final report of 2013 I'd like to wish you all a very Happy New Year in 2014!!!!! Rangers were beaten at home for the first time in the League this season by fellow high flyers, Leicester City, in a game where we have witnessed probably the worst referee I have ever seen - Paul Tierney. Myself and Lee have done a swap this week so unfortunately, you have to put up with my drivel again for this one..
With this game being moved to the early game for the Sky cameras, being the last shopping weekend before Christmas, I decided to make an early start with the anticipated heavy traffic. But low and behold, the roads couldn't have been any clearer and I arrived at 10am, followed by Jenson moments later. As it was early, we went to the Springbok for a couple of pints and were joined by Sam, Luke, Trev and son, Travis. We later joined Lee, PK, Jointy and Lorna in the ground as kick off approached, with most of us in a positive mood. 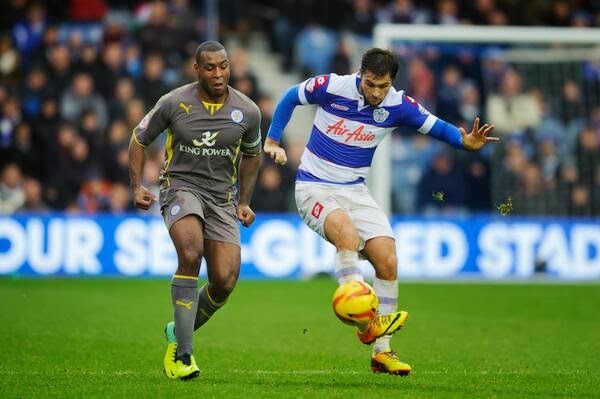 Rangers started very well and O'Neill and Kranjcar brought saves from Schmeichel in the Foxes goal. 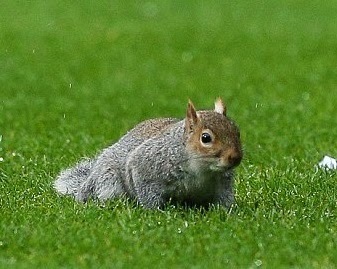 Shortly after, the Loftus Road squirrel made a return to much amusement to all watching, also bringing out a 'One Luis Suarez' chant from the R's contingent. Quitre unbelievably, this held up the game for about 5 minutes with the officials not knowing what or how to deal with it, which laid the platform for the rest of the match as far as the referee was concerned. It eventually scurried away as a couple of players from each side chased him away..
Rangers continued their dominance and were unlucky not to be in front when Kranjcar's lob was cleared off the line by Moore. But on 41 minutes and against the run of play, the visitors took the lead when Nugent's flick on was brought down by Vardy, with a strong use of his arm, before he smashed a cool finish into the net. Of course, neither ref nor linesman saw it and Vardy chose to celebrate freely in front of the Loft. The second half saw Rangers having plenty of possession but struggling to break down a well marshalled Leicester defence, this along with a referee making some baffling and head scratching decisions that were frustrating the home support. Even more so on 63 minutes, when Matty Phillips turned in the box to be caught by Liam Moore before going to ground. With his performance so far, it was no real surprise that neither the referee nor his assistant saw this one. Charlie Austin shot wide on 65 minutes and the more the game was going on, the more it looked like it just wasn't going to be our day. Leicester nearly doubled the lead on 78 minutes when James's powerful effort was deflected onto the crossbar with some venom. But Rangers job was about to get harder still with 6 minutes to go - the customary Joey Barton yellow card came after a foul on Taylor-Fletcher, but very quickly turned to a red when Joey kicked the ball at the same player. Extremely silly from Barton and some may quickly say this may well have cost Rangers a point at least, but it would unfair to be to harsh at this time following the excellent season the midfielder is having. As the clock ticked away, the referee didn't feel Yossi Benayoun being smashed in the face was worthy of a late penalty and Leicester held on for their 3 points. In summary, there is no doubt that this was an extremely frustrating afternoon for R's fans and as mentioned, this set of officials were certainly the worst seen this season, including decisions to award a free kick when a player falls over his own feet and not even talking to a player that kicked Kranjcar two feet up in the air. No doubt with a performance like this, Mr Tierney will be promoted to referee a Premier League game next week! Lee will return on Boxing Day to review the Forest game but, on behalf of myself and Lee and everyone connected with Lofty Heights, we wish you all a VERY HAPPY CHRISTMAS!! QPR returned to the Top of the Championship after an excellent 2nd half performance brought home the points in a cold, wet and very windy, Blackpool this afternoon. Following our nightmare trip to Burnley a few weeks back, it was decided that we would make an early start for this one and after all the pick ups etc, got on the M40 at 9.30 - myself, joining Jenson, PK and Trev with Lee, Jess and Luke not far behind. Unfortunately Sam was unable to join us today. After a very brief stop, we swapped the sunshine from the south to the wind and rain up North and parked up in Blackpool at around 12.30. We made our way to the ground at about 2.30 where Trev decided to do some promotional work for part time actor, Jenson, who, whilst in the queue for tickets, pointed out very loudly that an Eastenders/Lucan//Holby City/Endeavour star was amongst the locals. He even took a photograph whilst saying things like - it is definitely him, that's him from Eastenders etc - it was very amusing to see the locals looking on with interest. We grabbed a quick pie before taking our seats amongst a very healthy and vociferous R's away following as the conditions rapidly worsened - the conditions of which played a huge part in what was a very forgettable first half, I think all that were there will agree that the least said about that, the better - Rob Green pushed away Steve Davies' header, before Ferguson's free-kick caused havoc in the area until Craig Cathcart's effort was tipped over. But both sides were finding the conditions difficult and as said, the half was easily forgettable..
Rangers looked much more positive in the second half, especially with Niko Kranjcar on the field who replaced O'Neill on 54 minutes and Matt Phillips forced a decent stop from Gilks. At the other end, a low drive from Tom Ince brought a fine save from Rob Green to keep the scores level - but the score didn't remain that way for long and just past the hour, Rangers took the lead - Former Seasider, Matty Phillips struck from 25 yards and flew into the net following a slight deflection. Phillips nearly made it two moments later but his low effort was pushed wide by Gilks in the Blackpool goal. The goal had completely changed the game and Rangers were looking dangerous every time they came forward. The game was made safe on 75 minutes following a lovely move - Simpson found the excellent Phillips on the right, who played a neat one-two with Tom Carroll before sending in a superb cross to find Charlie Austin who powered his header home from close range - it was now party time in the Rangers end..
A two horse race this week with Trev, Lorna and PK picking out Assou-Ekotto for another masterclass at left back. But with a goal and assist against his former employers and with votes from myself, Jenson, Lee, Jess and Luke, this weeks award goes to Matty Phillips. expert analysis from myself, Lee and Jenson on the Steak - eaten quickly with the temperature not being overly hot, but tasty enough albeit very small, myself and Jenson awarded an 8 each with Lee, who is enhancing his reputation as the Simon Cowell of pie judging, awarding a 7. A further 7 was awarded by PK for his Chicken and Ham, also sampled by Trevor who thoroughly enjoyed and awarded7.7 the highest mark of the day with 8.5. In summary, the second half performance easily wiped away the memories of the first and a great time was had by all in which has been my favourite away day so far this season. A good away win that takes you back to the top of the league, well that's hard to beat. The journey home, despite dreadful conditions was also a breeze and saw us back in Wycombe by 8pm. Much later, we were all thrilled to see that we made a brief appearance on the Football League Show, we are all in the pic, some partially covered, but no mistaking Trev, who wasn't actually celebrating the goal, but the news filtering in from Goodison that Lukaku had got an assist for his Fantasy Team :)) Great work from Lee for the photo... Just in this pic alone, are more away fans that Fulham took to Everton and it has to be said, with free travel offered!!! Lee will return next week to review the televised top of the table clash with Leicester and seeing as this is my last report before so, may I take this opportunity to wish each and every one of you a VERY HAPPY CHRISTMAS!!! The gang assembled on the wall just outside the Upper Loft entrance just after two to have a catch up and were very surprised at the lack of traffic issues this afternoon, especially with the run to Christmas well and truly on and Westfield getting more shoppers walking through their doors, who knows what it will be like before the Leicester game the weekend before Xmas....... I think a train journey would be in order when it arrives. Lofty, PK, Jenson, Sam, Luke and myself made our way in twenty minutes before the game for some refreshments (pie and drinks) ahead of the tough game ahead. One change was made from Tuesday's win with Matt Phillips taking the place of Gary O'Neil. Before the game started we took part in a minutes applause to celebrate the life of a great man Nelson Mandela. There were not many action points in the first half, however it was Blackburn that were the closest to scoring as Lowe's header from Marshall's cross beat Rob Green, only to be Clint Hill on hand to head the ball over the bar from a yard out. Rovers were out muscling the R's in midfield and were proving to be extremely hard to break down as their five man midfield found themselves with a huge amount of space against the midfield pairing of Carroll and Barton. Junior Hoilett was having a torrid time of things and often found himself being too predictable when he always cut in from the left wing and never took on the full back and crossed for an advancing Austin or Johnson in the area. The first half was forgettable and it's a credit to the visitors who made it a tough challenge to break them down. Jordan Rhodes was offering very little, which was a relief, however Blackburn did look dangerous on the counter attack and we had to be cautious of this. The R's started the half a lot better than usual and started to find little sparks that were beginning to ignite the R's firing line and on the hour our best chance was created. It all started when Hill's defensive mistake was rectified by Barton on the edge of the Rangers' penalty area. Barton then played a superb ball down the right to Johnson, who managed to wriggle free and advance to the right side of the Blackburn penalty area and drilled his cross towards the penalty spot, firstly Austin dummied so Matt Phillips could smash the ball home to the half guarded net but somehow Eastwood in the Blackburn goal made a tremendous save to deny the R's of the lead. Moments after Phillips had has shot saved he was involved in a double substitution. 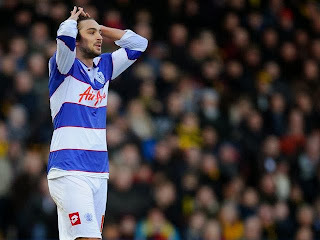 Junior Hoilett and Matt Phillips were both replaced by Niko Kranjcar. It was a very confusing change as Hoilett was deserving of being hauled off against his former club yet Phillips had done nothing wrong and had the best opportunity for the home side seconds before. Redknapp completely relinquished all the pace and width we had for a creative Kranjcar and O'Neil who spends more time in the centre of midfield, exposing Danny Simpson and also forcing Simpson to play as more of a wing back as he was our only outlet on the right hand side. Ten minutes later the R's had the best chance of the game. Assou-Ekotto done superbly well down the left wing and drilled a superbly weighted cross into the penalty area and Austin cushioned his header to the far post and somehow saw his effort hit the inside of the post before being scrambled clear by Eastwood, only to see O'Neil follow up with a volley but Austin could not move out of the way in time and deflected the shot wide. All in all it was a hugely frustrating game but Blackburn to their credit set themselves up with a physical and defensive plan that worked excellently for them. 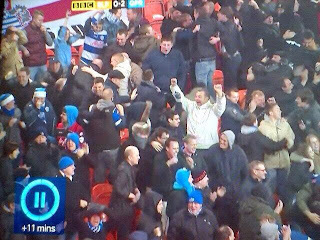 When Austin's header hit the post we all knew it just wasn't going to be our day at all! We have to dust ourselves down now and travel to play a weakened Blackpool side that is blighted by suspensions and pick up a vital three points ahead of four very testing games. Our Man of the Match sees four nominations on this occasion. Luke chose Andy Johnson, Sam voted for Danny Simpson and Jenson opted for Clint Hill. However with four votes from Jess, Lofty, PK and myself, our winner this week is Tom Carroll for an outstanding display at the heart of the R's midfield and pulled the strings when the R's attacked and also put in a huge defensive shift against a physical Blackburn side. Lofty returns next week as we travel north to sunny Blackpool!! Rangers' looked to get their promotion hunt back on track as Bournemouth visited Loftus Road on a cold Tuesday Evening in West London. 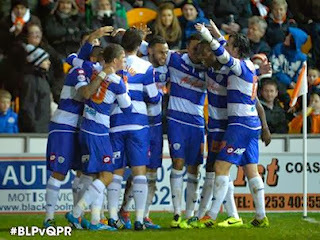 Could the R's put the terrible showing from Saturday behind them and get back to winning ways? We're about to find out. Sam and myself set off for W12 later than usual only to find that traffic on the A40 had gridlocked the area, so we decided to re-route and arrived at the ground in good time to meet up with Luke (and friend) before having a good chinwag with Michael and Zach ahead of the game. Unfortunately Lofty found himself stuck in the gridlocked traffic at Park Royal and didn't move from 6.30 until kick off and had to abandon the final part of the journey and turned around to head home. Absolutely gutted for him!! 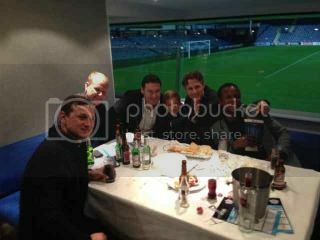 Jenson was lucky enough to find himself enjoying the delights of a box this evening where he shared a beer (or ten) with members of the 03/04 promotion season squad, lucky git!! Jess made her way straight from work and took her usual position in the Paddock with her dad and brother. After Ranger’s disappointing show at the weekend at the hands of Doncaster we were looking for a big response against newly promoted Bournemouth at Loftus Road having only dropped two points all season, conceding only two goals. Redknapp sprung a positive surprise by bringing in Johnson, Carroll and Hoilett for Kranjcar, Phillips and Jenas respectively. Finally this looked like the 4-4-2 that Ranger’s fans had been crying out for, especially after the understanding Johnson and Austin have shown in their short spells together recently. Rangers started brightly, Austin’s powerful header being tipped over the bar early on by ex-Rangers man Lee Camp. Shortly after a fine Richard Dunne header flew just over as the defender still goes in search of his first Rangers goal. Despite our early chances Bournemouth did look positive to their credit, unlike many teams who have come to Loftus Road this season, time wasting from the first whistle and parking the bus in anticipation of getting a draw out of the game. Despite this they still failed to create many clear cut chances. It didn’t take long before the usual unsympathetic refereeing towards Joey Barton reared its ugly head. 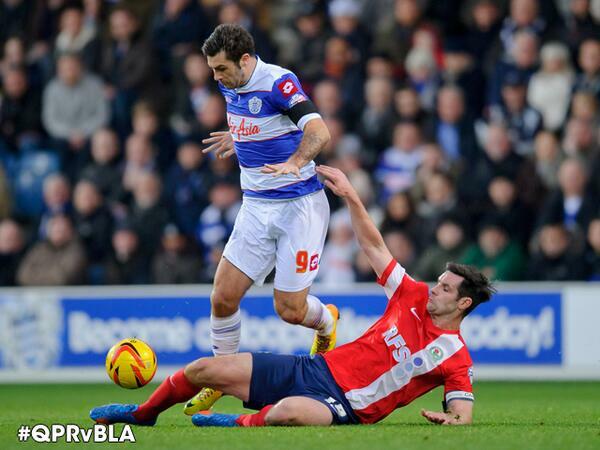 After fouling Arter and conceding a free kick there followed a blatant kick at Barton leaving him on the floor. We all know if this had been Barton kicking an opponent we all know what the outcome would have been. Bournemouth got away with what appeared to be a clear red card offence however this only inspired the R’s and it wasn’t long before Rangers made the breakthrough. Andy Johnson flew down the left wing and hooked the ball back on the touchline into the path of Austin, who coolly took the ball down before slotting through the legs of Camp. On the half hour mark the appalling officiating continued. Austin found himself through on goal only for the last covering defender Cook to forget that he was in fact a defender and not a goalkeeper and slide along the floor, palming the ball away at least a yard inside the penalty area. The Loftus Road crowd awaited the referee to point to the spot and potentially reduce Bournemouth to 10 men. Austin had already placed the ball on the spot. But to the bemusement of the home crowd and players the linesman decided he wanted to join in with the incompetence and advised the referee to award a free kick on the edge of the area and astonishingly no card of any description. Barton then fired the free kick into the wall and Bournemouth were quick to clear their lines. The half time whistle blew to a chorus of boos for the officials from the still stunned home support. The home faithful were then treated to a lap of honour by a number of players from the 03/04 promotion winning team. On to the second half, Bournemouth started brightly but were restricted to long range efforts which hardly troubled Rob Green. We were then treated to a somewhat rare second goal, Simpson whipped in a cross from the right and the ball found its way to the feet of Junior ‘hamstring’ Hoilett who was lurking at the far post. He managed to find a yard of space and fired home from an acute angle, possibly via a slight deflection. Bournemouth then made a double substitution to try and effect the way the game was heading. Neither player made much of an impact. Whereas the substitution for Rangers of bringing on Matty Phillips turned out to be an inspired one. No sooner had he entered the field he jinked his way past a couple of Bournemouth players and into the area rifling a shot into the back of the net, beating Camp at his near post. Rangers’ fans had been treated to a third goal for the first time this season. Not wishing to use up our goal allowance all in one night Rangers seemed content to sit back and see the game out. For once we could relax and enjoy the last 15 minutes of a game for a change. This turned out to be a comfortable, yet eventful evening. Bournemouth were by no means the worst team to visit Loftus Road this season but today Rangers fully deserved the win. The signs are certainly positive from today’s display and we all hope this is the beginning of a team really beginning to gel together. The change in formation seemed to take the pressure of goals off Austins shoulders and he looked like he had much more freedom, the sharing of the goals out today can surely only do wonders for everyone’s confidence. The return of Tom Carroll also looked to do wonders for our midfield, with him pulling the strings all night. Thanks Jess and Clive for your insights!! Overall to get a 3-0 victory behind was a welcome sight and really gave the fans some real hope ahead of the testing fixtures that are ahead in the coming weeks. I honestly cannot believe some of the refereeing decisions I witnessed today. The kick out at Barton was disgusting and how a red card was not produced is beyond me, not even getting a yellow card out was a joke!! As for the handball, it was clearly in the area denying a clear goalscoring opportunity yet we got a free kick and not even a card being produced was even more shocking!! Then to see Barton commit is first foul, a trip on a Bournemouth attacker, and have a yellow card handed to him just shows how referees look to book Barton because he is Joey Barton! You watch that bald idiot start refereeing n the Premier League now as a reward!! As for our visitors, despite the two incidents mentioned above, they were a good footballing side and passed the ball around well, particularly in the second half and created some decent chances to get level before Hoilett's goal and kept on plugging away until the final whistle. Home form is going to be key for them in their quest of staying in the division and if they keep applying the work rate that I saw today then you can see them staying in the division and building forwards into a second season in the Championship. The Lofty Heights Man of the Match has three candidates. Firstly I'd like to mention Andy Johnson for a terrific work rate and two assists this evening, however he received zero votes. Jenson picked out Hoilett, Clive, Jess, James and I voted for Joey Barton, who I and the people standing around me thought was the best player by far tonight. However with five votes from Sam, Luke, Luke's friend, Trevor and Michael our Man of the Match today is Charlie Austin. I will return on Saturday as we host Blackburn Rovers. We were delighted to be asked by AFC Bournemouth supporter, Peter Bell from the excellent Cherry Times Blog, for an interview ahead of tomorrow night's game..
You can find the article here - Cherry Chimes Talks to QPR Blog Lofty Heights.. 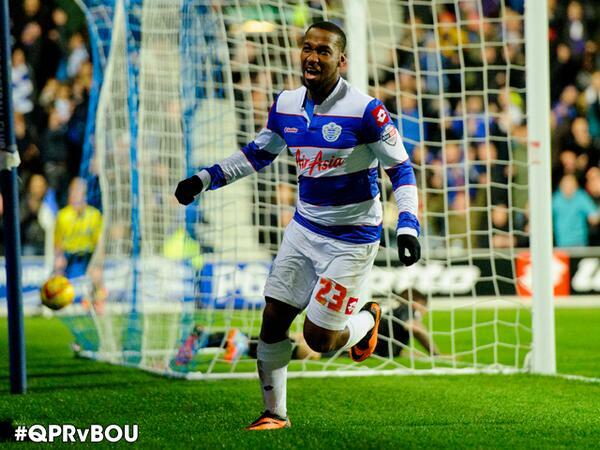 Thank you, Peter for giving us the opportunity and we hope you enjoy your visit to Loftus Road. 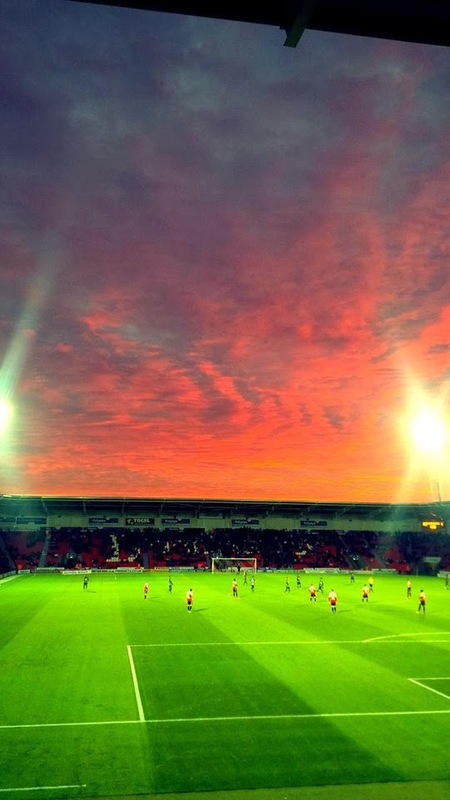 Rangers Don For at the Keepmoat..,. 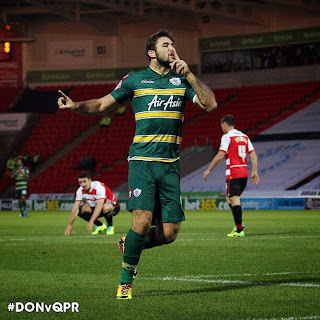 QPR suffered only their second league defeat of the season in what was certainly an afternoon to forget at the Keepmoat Stadium. Even with a motorway closure, the journey was still a breeze and Jenson, PK and myself, hooked up with Lee and Jess, diverted to the A1 and stopped at a very nice coffee shop about 30 miles from Doncaster for well, a coffee and a very nice and relaxed catch up. Sam and Luke decided to give this one a miss.. Onto the game and the first half was probably as dull as I have seen all season with neither side looking to make any sort of early impression. Rangers had lots of the ball but the first real chance came on 25 minutes when Kranjcar blasted well wide following a pass from Danny Simpson. Rangers broke quickly out of defence and Jermaine Jenas managed to poke the ball through to Austin whose fairly tame shot slipped through Turnbull's fingers and trickled into the net. Despite the lead there was much concern down on the concourse at half time and again, mainly down to the formation and the attacking threat, or lack of it. Would it be a case of Rangers settling for what they have and trying to ride the game out.. I bumped into an old mate, Russell at half time who I had not seen for nigh on 20 years and after travelling alone, joined myself and the gang in the second half. Matt Phillips brought a comfortable save out of Turnbull and this was the last time the home keeper was really tested. Three minutes in and it was all square and like the Rangers goal, it had a touch of good fortune about it. Wellens picked out Robinson on the right and the Doncaster striker curled the ball into the net from a narrow angle when it looked as if he was trying to cross the ball. His celebration seems to suggest the latter. Rangers again had lots of the ball but the attacking threat was so sadly lacking, Matty Phillips in particular always choosing to go backwards with his passing instead of taking players on and attacking the right flank. 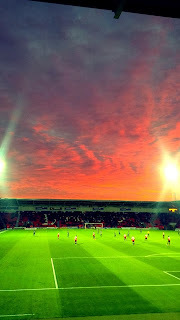 But as the game ticked on, it was Doncaster that were looking the more likely and Macheda should have done better than hit the side netting. Clint Hill had the R's best chance to sneak into the lead but looped his effort just over. But with a minute to go, Doncaster got their winner and much deserved it was too I have to say - Quinn meeting Duffy's corner and powerfully heading down and into the roof of the net. We need to bounce back now and have a great opportunity with 2 home games in quick succession. Lee will return in the week to review, hopefully, our home win over Bournemouth..